For efficient operation of a steam plant or turbine system, steam flows must be consistent. This requires that condensate be returned in the same manner. Cyclic condensate flow will affect steam flow patterns if the condensate does not freely leave the process equipment for various reasons. In many instances a jet pump is needed to augment and optimize heating surfaces that may become "water logged" under vacuum conditions. What is a Jet Pump ? A jet pump utilizes a venturi to pump liquids and gases by use of a motive fluid (gas, liquid or steam) to entrain the pumped material from one place to another. When pumping hot condensate under a vacuum for removal from a process, a standard pump would cavitate under these conditions causing the pump to fail, while a venturi is not susceptible to cavitation. The use of a jet pump allows condensate to be removed from process under vacuum conditions. - Continuous heating of fluids below 200 degrees F with throttled steam will fall under vacuum conditions and retain condensate cyclically causing a "Saw tooth" steam flow pattern. 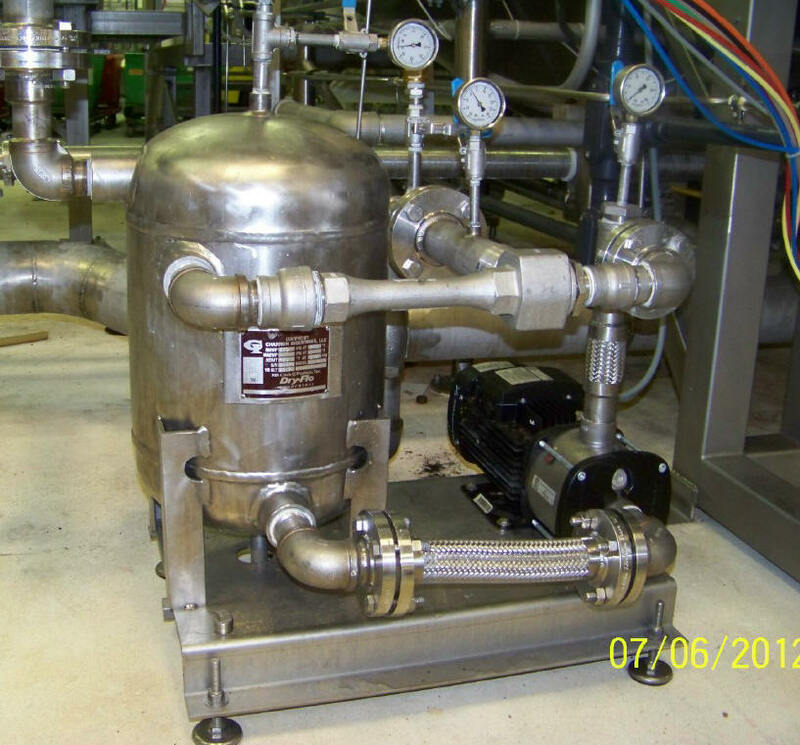 - Batch heating process can retain condensate once the steam valve closes, trapping condensate that sub-cools during the next fill, blocking steam entry, slows product heating because pressures needed to push the condensate out are slow to build. Often, this condensate goes to drain to augment flows. - Air vacuum breakers allow condensate to leave under vacuum conditions (with gravity flow) but then leads to air binding, greatly slowing the heating process until the air is purged. - Often, condensate is expected to exit a trap and is piped upward several feet to a vented receiver causing an excessive back-pressure. The above note a number of regular conditions encountered in steam flow problems. Other problems can occur from improper piping, traps etc. Each application must be considered independently. But, for conditions that can only be solved by use of a jet pump, the following is offered. Steam condensate recovery from food and chemical process equipment often occur under a vacuum conditions, especially when throttling. Under these conditions, the steam pressure cannot be counted on to readily push the condensate out of the vessel, effectively reducing steam heating area which results in slower production rates. Solutions such as higher vessel steam pressures can have negative effects such as damaging “water hammer” or scorched product and still experience slower than optimum performance. Throttling steam in hot water heating applications operate in a continuous vacuum. (165 Degree F ~ 5.3 Psi absolute or 9.4 Psi vacuum) Use of vacuum breakers introduce cyclic heating and surging of steam flow with swings in temperature (instability). Use of higher steam pressures also result in “flash steam” causing losses of over 10% in total heat energy when using a vented condensate receiver. In these systems, a “jet pump” can be utilized to draw the condensate from the vessels trap and then send back under pressure to the boiler system (without venting) collecting 100% of the condensate and preserving heat energy. This active approach to condensate removal greatly improves production rates and allows for use of much lower steam pressures. In some instances it can be used to correct for some piping design flaws or elevation constrictions.